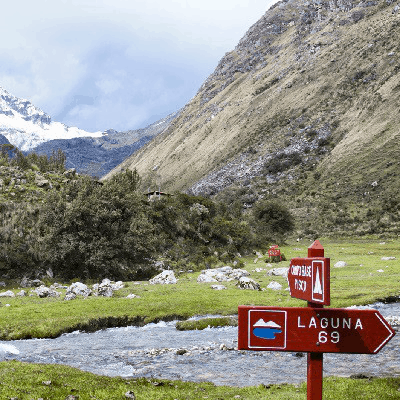 Laguna 69 tours can be booked either in advance or after your arrival in Huaraz. It’s always recommended to book early since the tour is popular and tickets can run out. However, it’s recommended to spend a day acclimatizing in Huaraz before attempting any strenuous activity, so you’ll have time to book your tour from the city if you haven’t already. The best way to book your Laguna 69 tour is by searching on the tour comparison website Find Local Trips. Here you’ll be able to contrast different tours and choose the option best fitted to you and your schedule. It’s the easiest way to go and typically costs between 40-70 Peruvian Nuevo Soles (about $12-20 USD). The Laguna 69 tour takes approximately 5 hours. The trek up to the lake takes approximately 3 hours and then another 2 hours to return. At an incredible altitude of 4,500 meters. The specific details of treks vary from operator to operator but as a whole, they generally tackle the same route. Pickup from hostels happens at approximately 5am in order to reach the laguna and get back at a reasonable hour. After a 2 hour and 30 minute bus ride from Huaraz, the group reaches the spectacular Llanganuco, a fascinating turquoise colored lake guarded by two towering mountains looming largely overhead. This is an excellent time to soak in the surrounding scenery and take a few pictures before you begin the trek. The trek begins at approximately 9:30 at an altitude of 3900m and takes in or around 3 hours depending on how quickly it is walked. When you’ve completed the hike, you are given an hour to eat, relax and enjoy the scenic surroundings. The hike can be challenging at times but the view at the end is definitely worth the struggle. Laguna 69 is one of the most spectacular natural viewpoints in all of South America and an incredible photo opportunity for travelers. This beautiful glacial lake and the surrounding iced-capped mountaintops is a must-see destination for travelers in Peru. The best part is that it’s only a day trip away from nearby Huaraz. Book your tour now at the link below.